You can fill the iCaching database with GPX or LOC-files. You can also import zip-files with pocket queries inside. ICaching will extract and import them. Every geocache has only one instance in the database, but can be linked from multiple Folders. 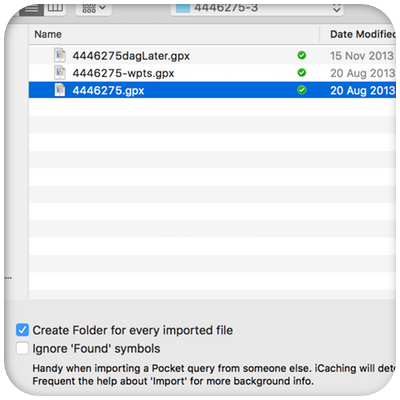 On import of a newer gpx-file, the cache-information will be updated. 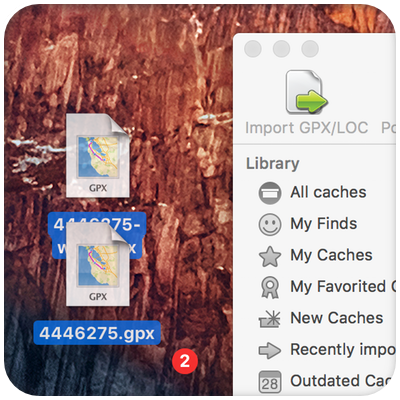 Importing an older gpx-file will leave the info unchanged. 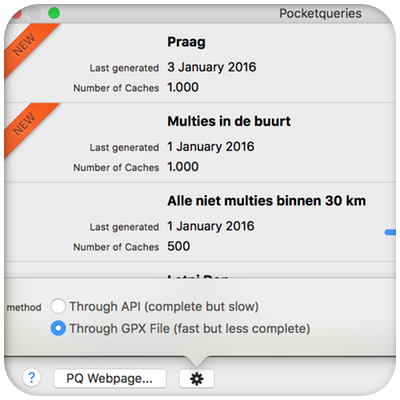 You can download your Pocketqueries straight into iCaching. When importing a Pocketquery, iCaching creates a new Folder named by the Pocketquery. You may rename this Folder, but iCaching remembers the corresponding Pocketquery. So next time you import a newer version of the same Pocketquery, the content of this Folder will be updated. As you expect from a real Mac application, iCaching supports drag-and-drop. Select one or more GPX, LOC or ZIP-files and drag them into the left pane to import.